‍Whatever you do, please don't call Whit Atkinson a hero. 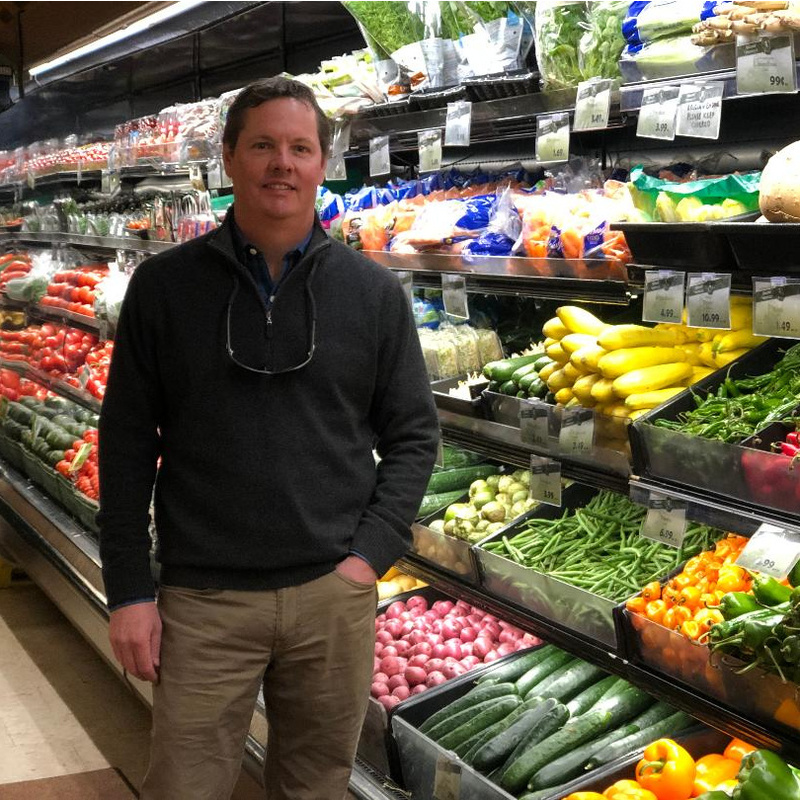 As vice president of Atkinsons' Market, Whit credits his crew for the success of the family-owned grocery chain. But his commitment to purchasing from community food producers has helped make Atkinsons' one of the Valley's largest access points for locally grown food. "Food is important to me both personally and professionally," explains Whit. "Not only do I love fresh, healthy, high-quality food, I have an obligation to provide it to the Wood River Valley." LFA: The Atkinson family is well known in our valley, but few of us know the history. Can you give us a brief overview of your family’s history in our community? WA: My grandparents moved to Picabo, Idaho, in 1938 to run the local store. In 1956, they decided to venture out on their own. With the help of their sons, Don and Stan (my dad and uncle), they started what is now known as Atkinsons’ market in the colonnade building in Ketchum. In 1969, Atkinsons’ moved to its current location in Giacobbi Square. In 1977, we opened a store in Hailey. The third generation - my brother Chip, myself, and our wives Monica and Susie - bought the business in 1995 and continue to run it today. In 2003, we bought the Valley Market in Bellevue. The fourth generation is currently in training to continue what Chuck and Floss started 63 years ago. LFA: What makes Atkinsons’ Market different than the average chain grocery story? WA: What makes Atkinsons' different from a national chain is that we can tailor each store to the community it serves. By being local and independent, we also are able to focus on small local farmers, ranchers and producers that chains and larger format stores cannot. I think the biggest difference is, because we were born and raised here, we are hyper focused on doing what is right for our community. We also pride ourselves on our service to our customers and the strong relationships we develop because of our long-term associates. LFA: How is Atkinsons' working to reduce food waste? WA: We continue to make efforts to reduce food waste by giving produce scraps to many many pork and chicken producers in the valley. We also try to keep anything edible from the waste stream. Last year, we donated over 23,000 pounds of food to The Hunger Coalition. We have created a great partnership with The Hunger Coalition that allows them to come and pick up produce twice a week. LFA: What does local food mean to you? WA: From the beginning, Atkinsons’ has understood the importance of providing an outlet for local farmers, ranchers and producers. It is a win-win situation. This mission has not changed other than there are now many more vendors. It is always a much more pleasant experience meeting face-to-face with the farmer or rancher that has grown the product themselves. LFA: About how many Idaho producers are represented in Atkinsons' stores? WA: We just completed a detailed list of all local producers and came up with 93 - though we offer hundreds of unique items depending on seasonality. LFA: What's your favorite Idaho product on shelf? WA: It would be impossible for me to pick a favorite product on the shelf because we have so many great local products. I love local asparagus in the spring, morel mushrooms in May, Hagerman watermelons in the summer, and Simple Kneads’ cookies all year. Currently, a new favorite is Desert Mountain Grass-fed Beef = great Idaho ranchers with truly sustainable and regenerative practices, and the best tasting 100% grass-fed beef that I have ever eaten. LFA: What’s the biggest barrier to offering more local produce, meat, eggs, and dairy? WA: I think there are two major issues with providing more local products. Number 1 is current USDA regulations concerning meat and poultry. It is very difficult for small producers to get the products to market because it is so cost prohibitive. Number 2 is transportation. It is often difficult for farmers to get their products to the stores either because of cost, time or both. LFA: What change would you like to see in the Wood River Valley in terms of food? WA: I would just encourage any producer with a passion for good food to make sure we see their products. We are supportive of anything local and are always looking for new partners. We are certainly trying our best to encourage customers to choose local products so the valley we call home can become a stronger and more independent food system. Again, it is a win-win situation for all of us that choose to make a living here.